My own Grandma used to walk backwards down the stairs. Big Spiders - it’s their Knees. Fun, quirky, charming, creative, amusing, simple, dark, entertaining, imaginative (I also like using alliteration). Quirky, silly, childlike, imaginative, down to earth. Charlie from Charlie and The Chocolate Factory. He not only owns a whole chocolate factory but got to go into space in a Great Glass Elevator. 1988, it had the best music, then to 1992 so I could watch the Barcelona Olympics again. Why have you got the same haircut. Quentin Blake/Roald Dahl and Lauren Child. Omelette. It’s just nice to say. It sounds kind of cute. It’s also yummy to eat. If it’s to be a children’s book. Then The Twits. It’s really dark and mischievous while being really funny. If an older book then The Wrong Boy. It had me laughing and feeling sad all at the same time. It’s not a book for children though. Visit Izy Penguin's website to find out more about her books and illustration projects. 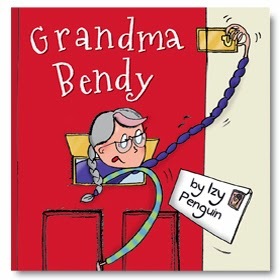 You can read our review of Izy's book Grandma Bendy here.